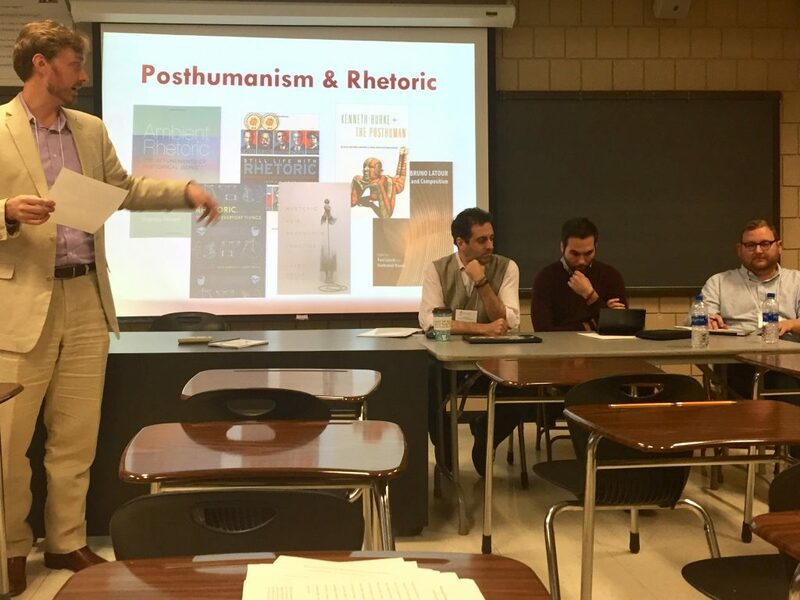 This panel on “Posthuman Futures for Rhetoric, Composition, and Pedagogy” examined the posthuman futures of rhetoric through two key aspects fo the field, ethos and pedagogy. Collin Bjork introduced the panel, situating it in the context of prior work in the field (see image above). This panel seeks to move beyond meta-level discussions about what posthuman rhetoric might be and instead explore ways that it might actually be used in practice. Bjork transitioned into his presentation, “Bitcoin and Posthuman Cumulative Ethos” (Paper and Slides available for download) by explaining his development of the concept of cumulative ethos, which he argues is a connection between artistic and inartistic forms of ethos. Such a link is important because it avoids a historically static formulation of ethos, repositioning it instead as one that is always in the process of becoming while still linked to its own history. Understood in this light, bitcoin is an emergent concept from human and non-human intra-actions that, through its underlying blockchain technology, has a form of cumulative ethos inherent in its design. Traditional currency, especially as it is no longer backed by the gold standard, relies on trust in the government which issues it. 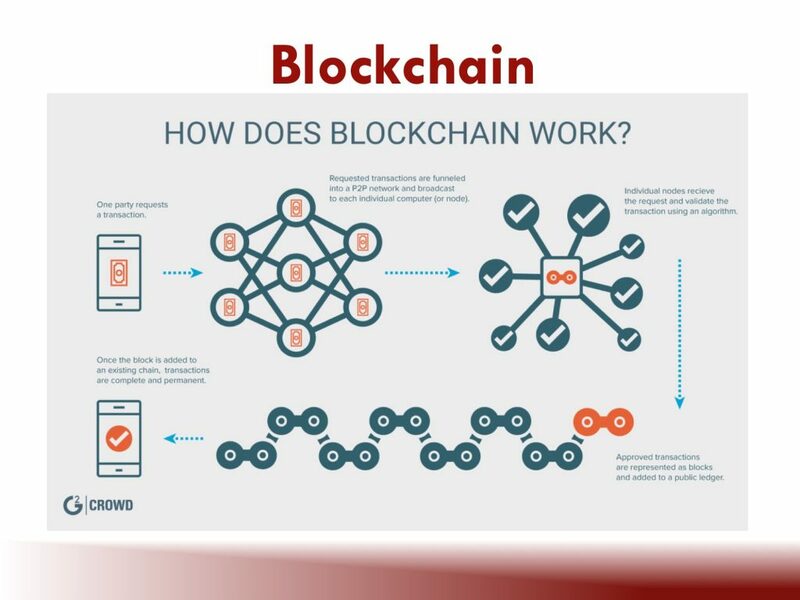 Cryptocurrencies like bitcoin, on the other hand, establish trust through the process of cryptography, as denoted in the slide below. Bjork argues that this functions similar to cumulative ethos. Trust is not kairotic because blockchain builds it up over time. However, blockchain is different because it doesn’t gain or lose credibility as it gets longer. The trust comes from the fact that it is public-facing, and doesn’t reside on just one person’s hard drive. One open question that remained at the end of the presentation is whether bitcoin is a currency or a commodity. Some people have treated bitcoin and other cryptocurrencies as a commodity, buying a large quantity of it, paying people to promote it so the price increases, and then selling it to make a large profit and leaving other holders with near worthless coins. 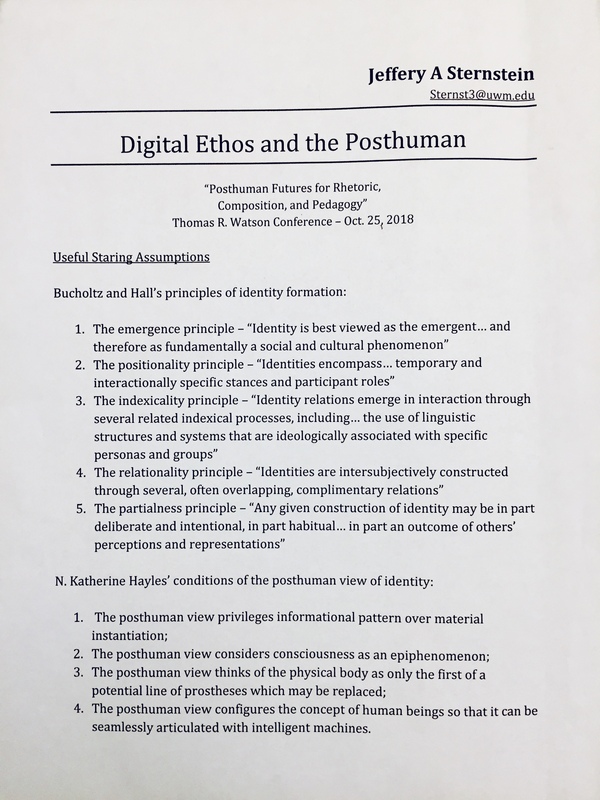 Bjork concludes that, like rhetoric itself, cryptocurrencies can be used for good or ill.
Jeffery A Sternstein began the next panel on “Digital Ethos and the Posthuman,” presenting several starting assumptions as per the handout below. Sternstein began his presentation by focusing the discussion on how one achieves an authentic sounding voice online through methods such as style, how one responds to others, etc. While using speech-like sentences is one method that has been embraced, others have instead moved toward spontaneous-sounding commentary. Why would writers abandon more orthodox rhetorical procedures for these new approaches? We can begin to understand this through a link to danah boyd’s work on fake news. The people who were being trusted in anti-vax conversations online were the ones who were saying: “I don’t know if there is a link to autism, but I’m concerned about your concern.” Strangers who don’t have all the answers are being turned to for help. Doctors are seen as talking to their patients in a formal, contrived way, while strangers are talking with patients in a more authentic and compassionate way. This shift in authority is not just with doctors, but can also be seen in trusting rumors over major news media. A new type of authority seems to be gained not through expertise, but instead through empathy that is offered. The development of authentic voice could be a reaction to this need for a more expressive style from writers. Our culture focuses almost entirely on good sense (in Aristotelian terms) to the neglect of good character or good will. As a pedagogical aside, Sternstein asks if we have ours students evaluate these latter two traits in the composition classroom. In conclusion, Sternstein leaves us with two questions to ponder in light of the issues he has raised. Should we encourage a more expressive and empathetic voice in first year composition? Should we take more queues from social media? Brent Lucia presented next, and focused on reflective practices in the writing classroom. 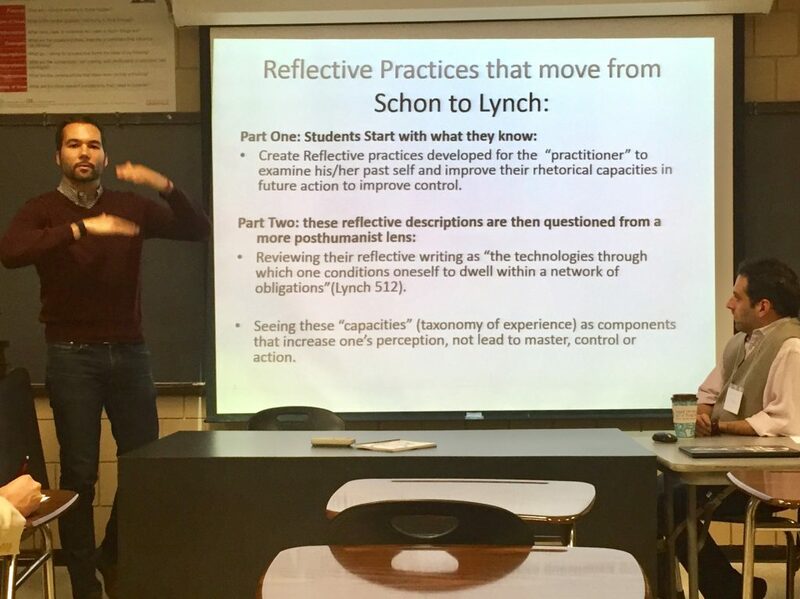 This presentation is situated as a critique of Kathleen Blake Yancey’s claim that reflection is the mode of inquiry by which students become agents of their own learning. Lucia argues that this view enhances the humanist discourse and follows a Cartesian ontology. Instead, how can we think about the body as an ecology itself? At first blush it seems that from an ecological perspective, reflection is not applicable. Does this throw the baby out with the bathwater by completely removing reflective practices? Is there any value from reflection that is left? Lucia argues that we can recover some value by locating writing not as a means of control, but as an “effect of ecology” that practices and embraces interdependence in a way that will help students see writing as an experience in itself, or rather, a way of being in the world. He suggests that this can begin by having students start with what they know and then question this writing from a posthuman perspective, as seen in the photo below. Lucia has worked to begin implementing this in the classroom by using concept maps in a writer’s network. In light of this work, he concludes the presentation with several provocative questions: Can we help locate moments of in-betweenness for student writers? In what way is it helpful to acknowledge situatedness when they write? What type of language should we use to discuss this? 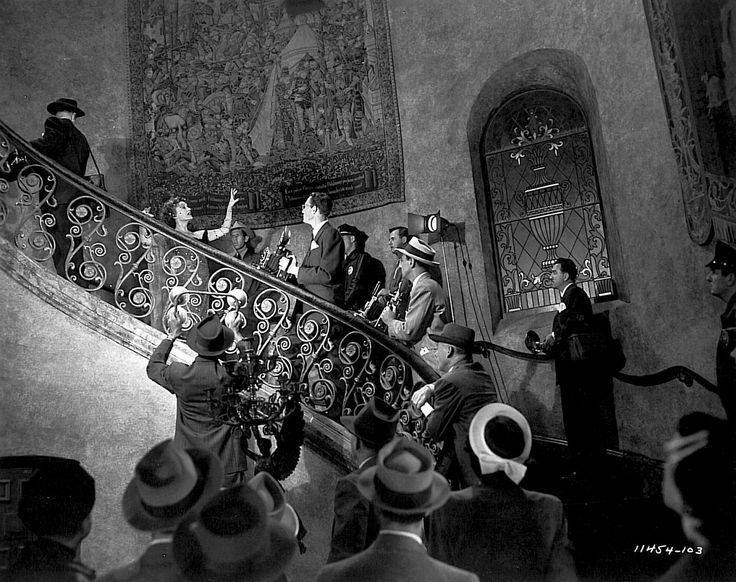 Jason Barrett-Fox concludes the panel with his presentation that argues for a method of recovering feminists differently after posthumanism through a Kittlerian perspective that he elaborates using the film Sunset Boulevard. From this perspective, the content of film is lost to the techno-ontological framework that produces it. Sunset Boulevard helps demonstrate this because it contains moments where medial technologies don’t just bleed into the real, but make the real. Mediation is actual and temporal disruption subsumes our skins and screens. This historiographical approach may not allow us to know ourselves better, but at least allows us to attune ourselves to messages the present could not carry. The overarching theme for this panel is that posthuman approaches are well positioned to provide new insight to not only rhetorical theory, but also rhetorical practice. Each panelist was able to demonstrate the value that a posthuman approach can bring to either scholarly work or the classroom setting. The ability for these panels to link together via ethos and pedagogy while still tackling a wide range of concepts, tools, and ideas proved enlightening and bodes well for the posthuman future of rhetoric. J.J. Sylvia IV is an Assistant Professor in Communications Media Theory at Fitchburg State University. His research interests include big data, posthuman media studies, and digital pedagogy.